DFS Scientific Assistant | Lab Assistant | Senior Expert Exam Call Letter 2017: Directorate of Forensic Science released notification regarding Exam Call Letter. Directorate of Forensic Science announced DFS Scientific Assistant | Lab Assistant | Senior Expert Exam Call Letter 2017. Candiates whose application confirmed they may download their Call Letter from ojas.gujarat.gov.in. 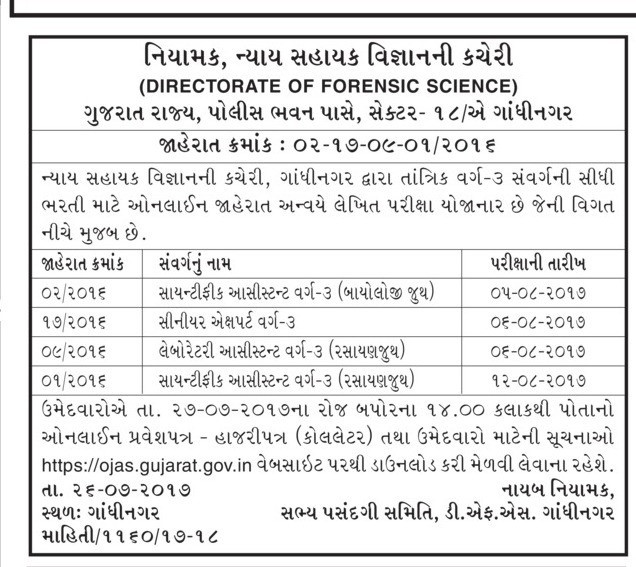 Directorate of Forensic Science published advertisement No:- 02-17-09-01/2016 for Scientific Assistant | Lab Assistant | Senior Expert class-3 posts. DFS invite candidates who have essential qualification and seeking for Government Job. Many candidate applied for these post. DFS announced Call Letter notification for all these posts Exam will b held on various date. Call Letter: Candidates who applied for Exam and application confirmed they may download their Call Letter from ojas.gujarat.gov.in. Candidate may download their Call Letter from 27th July 2017 to till Exam date. Candidates are advise to bookmarks this page and be regular touch on this page for get more latest updates about DFS Scientific Assistant | Lab Assistant | Senior Expert Exam Call Letter 2017.